Exciting a square Chladni plate with a violin bow. One of the many unique features of Caltech is our core curriculum. All of our undergraduates are required to take five terms of physics and five terms of math (all three terms freshman year and the fall and winter terms sophomore year) — though this will change for the class entering in the fall of 2013. Each fall, about 170 sophomores take Physics 2a, a course on vibrations, waves, and quantum mechanics, while the remaining 60 or so sophomores take Physics 12a, a souped up course covering similar material at a level more appropriate for physics concentrators. This term I am teaching Physics 2a. While 170 students is a lot more than in most courses I teach at Caltech, the workload is manageable, in part because I share the lecturing duties with another professor, and in part because we have a staff of capable and hard working Teaching Assistants who handle recitation sections and grade the homework and quizzes. The content and methods of Ph 2a are pretty traditional; I suppose the curriculum has not changed so much since Richard Feynman taught the same course in the same Lecture Hall exactly 50 years ago. I write lots of equations on the six blackboards using white chalk. (I’m not a big fan of writing on whiteboards with colored markers — my hand seems better suited for holding a piece of chalk.) But we have added a few technological enhancements since Feynman’s day. Sometimes I project computer animations from my laptop, like this one last Thursday demonstrating the Schroedinger evolution of a free-particle wave packet. And we use video cameras to project the demonstrations onto large LCD screens, which improves visibility from the back of the hall. Diffraction pattern produced by an 8 keV electron beam incident on a graphite crystal. Demonstrations take up a small portion of each 55-minute lecture, but I worry about them a lot. Actually I would never be able to get them to work at all were it not for the able assistance of Frank Rice, who sets them up and shows me how they work. My favorite demos are the ones illustrating wave interference and diffraction. I especially liked convincing skeptics that electrons are waves by diffracting them with a graphite crystal (that is, I diffracted the electrons, not the skeptics). 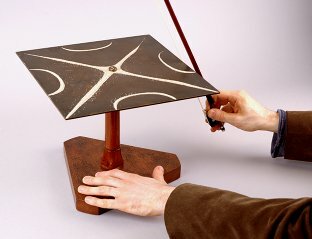 Another crowd pleaser was stroking a square Chladni plate with a violin bow to reveal its normal modes of vibration. But despite my careful preparations, not all demos go without a hitch. Absorbing a wave in the Shive Wave Machine by matching its impedance to a dashpot worked better in rehearsal. That’s showbiz. Caltech undergrads are an appreciative audience, but sometimes they can be tough customers. Well, they put down serious money, so they are entitled to a high-quality performance, right? I try to please them. After 30 years of teaching physics, I still get a surge of adrenalin when I lecture. When that stops happening, I guess I’ll be dead. Students sometimes provide much appreciated constructive criticism. Some have told me they find my voice “very soothing” or even “soporific.” I find this hard to believe, because from the inside I sound very animated, but I have heard it enough to take it seriously. On the other hand, a few find my lecturing style “overly frenetic.” You can’t please everybody. This entry was posted in Reflections, The expert's corner and tagged education by preskill. Bookmark the permalink. I feel a bit sorry for the violin bow. May be bad for the hair. On the other hand, I am not really sure if it’s any worse than stroking a metal string. Would any other method of stroking/rubbing work? Seems to require very light stroking (as not to upset the sand?) compared to what can be done with the hands. Why a violin bow? Did they/you apply rosin to increase the friction? What frequency did you get by stroking with the bow? This was torture to the ears, but pretty cool. Varying frequency. This video is great! Stroking with a violin bow is quaint in comparison, but a better test of the lecturer’s dexterity, which adds drama to the production. However, Preskill’s presentation was completely smooth, comprehensible, and filled with very entertaining animations in his PowerPoint presentation. And in many respects, it went well beyond my lecture. Finally, I want to say that without any exaggeration, John Preskill belongs to the top five best physics communicators in this world. Be sure that I haven’t written this sentence more than five times in the last 10 years. He is a fast thinker who knows how to analyze things in details, present them in a completely comprehensible fashion, and answer the questions that appear along the way. Caltech is so fuddy-duddy. I hope they start using 21-th century technology soon. A great teacher like you should be on Coursera by now. You need a movie agent, John! Oh, I have an agent. How do you think I got the Ph 2 gig? As one of your ph12c students from two years ago, I think that your voice would be great as some sort of voice-over on a physics movie or something. That’s funny … My brother David Preskill was an MD, and became a voice-over artist after retiring from medicine. As a fellow physics professor, I share your love of the craft of a good demonstration. Lately, however, I find that my enthusiasm is slightly dimmed by the research showing that students don’t actually learn much from the demos… or that any misconceptions they come in with are likely to be reinforced rather than challenged. It’s tough to swallow.